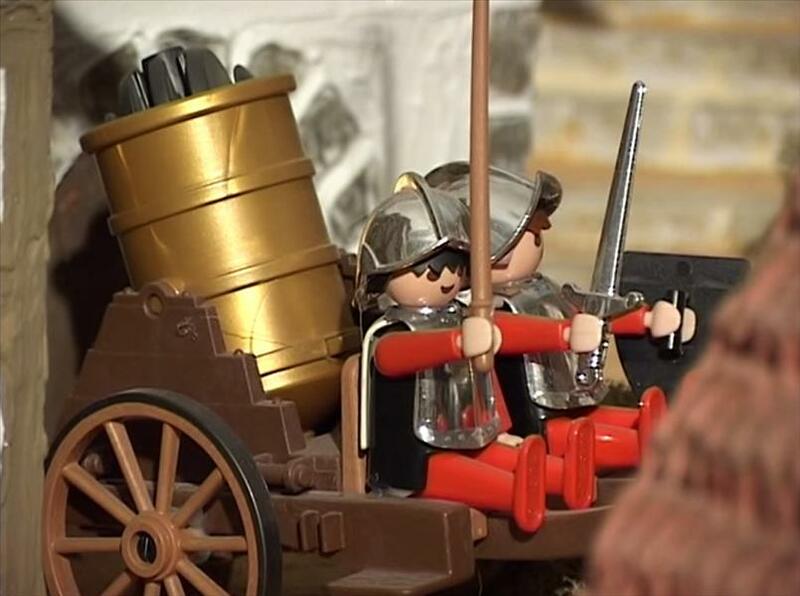 The magic universe of Playmobil action figures. Opens to the visitor with moreover a terrace with a breathtaking view on the holy lake cross !!! Young and old will be amazed. Housed in the former chapel of the Ursuline convent, this museum was created thanks to the donation of Bruno Bassado to the city of Aups. Its collections focus on discovering paintings, gouaches and watercolors of three great schools: Toulon, Bourges and Paris, which hosted the works of Simon Segal, a Russian figurative painter who had fled to France. At the heart of a Mediterranean landscape, open to the sky, come and admire the works of Maria de Faykod, a true virtuoso of sculpture. His favorite materials, marble and bronze. The sculptures are scattered in a natural space, with the desire to play between art and nature along a free and aesthetic path. The Museum’s collections, thanks to the prolific talent of the artist, increase over time. 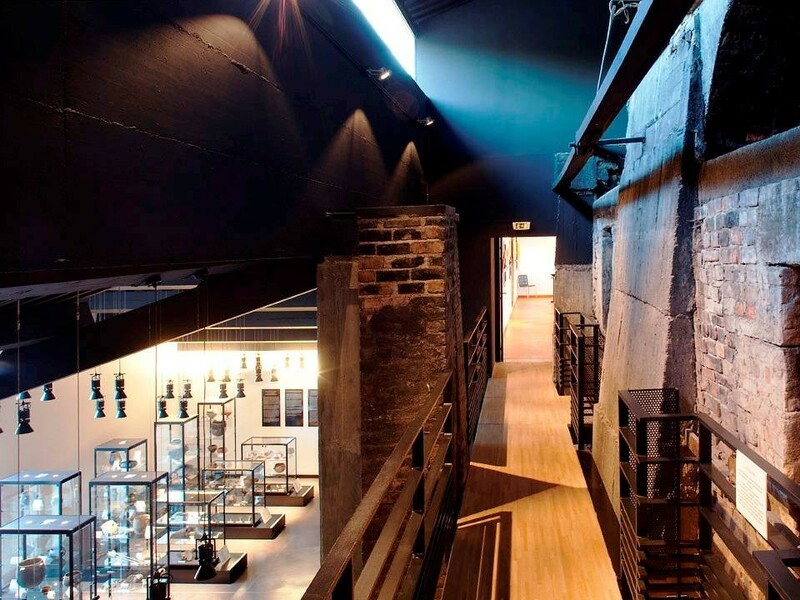 The Faykod Museum is an invitation to daydream and beauty, a place of pure aesthetic emotion. 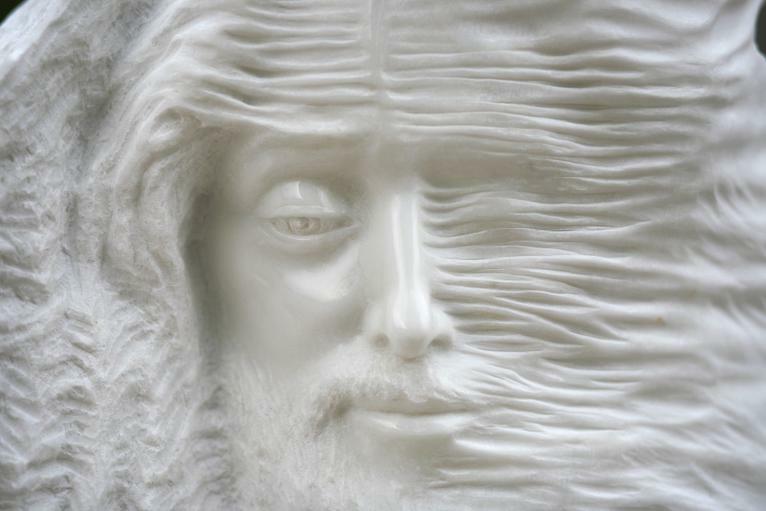 The marble of Carrara becomes, in his hands, a transcendent message in a quest that leads us to the perception of the absolute and a humanism turned towards the light. This small village is specialized in the shooting of wood since the sixteenth century. At that time many villages practiced this activity, also in other regions such as the Jura or the Pyrenees. But in Provence, it is only in Aiguines that the shooting of wood has survived. Indeed, the forest of Aiguines is rich in several species: beech, ash, alder and maple, used to manufacture many common objects. As for the boxwood, particularly sought after, it was very appreciated by the turners thanks to the delicacy of its grain, the beauty of its veins and for its resistant and thick roots. The boxwood is here in abundance and it is a raw material which costs little if one takes the trouble to look for it in the deep gorges of the Verdon because one had to dare to venture on the paths at the edge of the void before go back to the village and bring the wood back to the man’s back. The filming activity made it possible to have extra resources in the families. 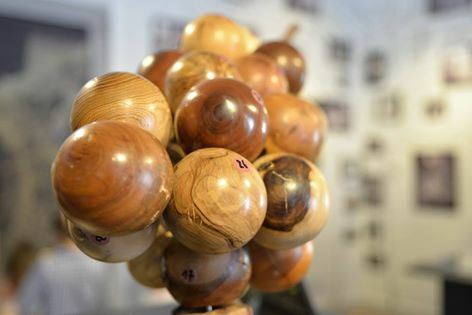 In the nineteenth century, with the industrial boom, this activity grew and Aiguines becomes the capital of woodturning, exporting the objects manufactured throughout France including the famous studded balls, the ancestors of the current petanque balls. The boxwood balls, once turned were studded by the “ferreuses”, these women of the village who nailed cm by cm, between 500 to 1000 per ball, to obtain a roundness and a perfect solidity to the ball. With the development of new technologies, the job of turner as a manufacturer of everyday objects has changed to become an artist who offers us his know-how, imbued with beauty and creativity. Salernes, commune of High Var is known for the manufacture of tometes. In order to rehabilitate the trades of the land, resulting from the country’s craft tradition, a vast ensemble has been created, by Jean Michel Wilmotte, architect and designer. Starting from the old buildings of an old tile factory, he imagined a new space of 3000 m2, combining old and modern buildings to present to the public a synthesis, in three themes, of the history of architectural ceramics. Archaeological, thanks to the discovery of ceramics on sites of the town, which has a collection of the oldest in Europe (7000 years). Mémorial presenting the production lines of reconstituted tomettes from the beginning of the 20th century. Artistic with the exhibition of an exceptional collection of 2000 tiles ranging from the Middle Ages to the 20th century, which shows the ornamental richness of ceramic pieces through architectural history. In 1986, a museum project was launched thanks to Danielle Berne and Maurice Petit, municipal councilors from the town of Quinson, who then exhibited archaeological material from excavations carried out 20 years earlier. Ten years later, a foundation stone is laid for what will become the museum of prehistoric Quinson and in 2001 the museum is inaugurated. 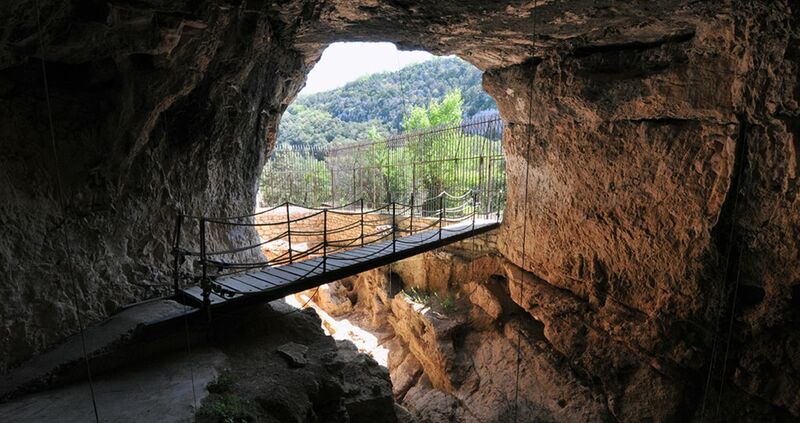 An impressive museography of reality, combining knowledge and fun activities to revive, thanks to the excavations carried out in the Verdon for half a century, prehistoric life. To accompany you in your visit, many informative panels, explanatory films, interactive consoles, models, maps in relief, bring the data and scientific lighting. to better understand this period in the history of humanity. 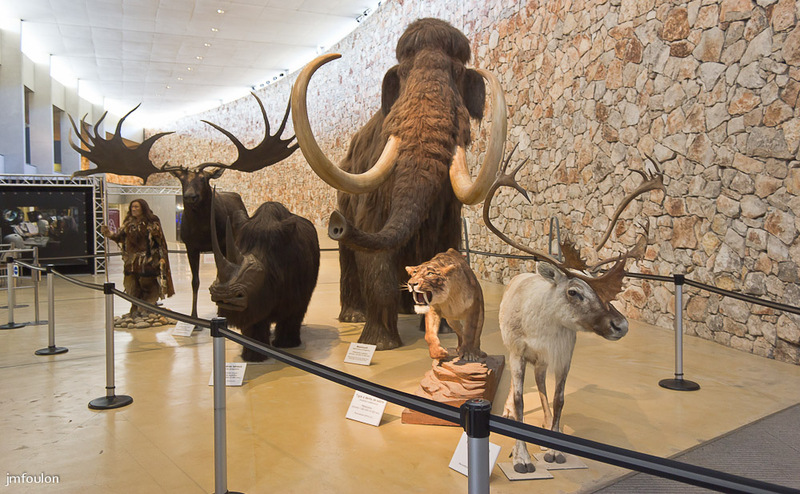 You are in the mood from the entrance of the museum by the exhibition of several animals, life-size prehistoric times: a woolly rhino, a saber-toothed tiger, a megaceros, a reindeer and enthroned by the herd, immense , the mammoth, emblematic animal of this distant time. The tour of the tour offers you to go back in time, from the era when the Gorges du Verdon was formed until Roman times. This exceptional cave, with its wealth of remains found on site dating back 400,000 years, is a classified historic site. It is one of the oldest living examples in the world. Accompanied by a guide, 50 m above the gorges of the Verdon, the site is accessible after 1:30 walk in the scrubland on a path punctuated with information panels on the landscapes you cross. The cave was discovered by Bernard Bottet in 1946. Scientific research has shown the occupation of the cave layer by stratum, the first one starting with the Anténéandertaliens, who arranged the space with rockings; then the black marks inscribed in the rock demonstrate the domestication of the fire then appears the time of the cut of stone (250000 years); the Neanderthal man takes over with the control of the flint and his cousin the Cro-magnon man who further improved the weapons (arrowheads, flint, blades). Neolithic in 6000 BC with ceramics, polished tools, grinding wheels and wheels to make way for the age of copper, bronze and iron. 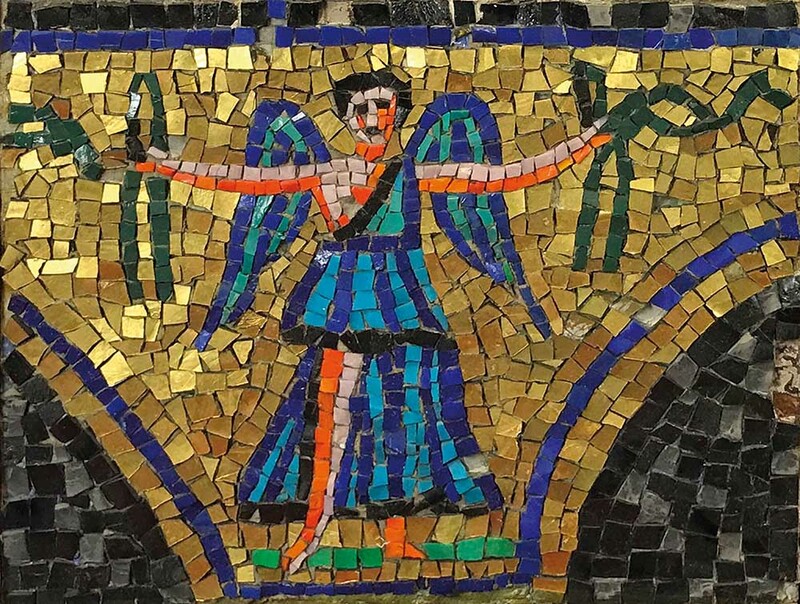 The upper layer is composed of the remains of Phocean ceramics from the time of the founding of Massilia (Marseille) and traces of passages of hunters and shepherds of the modern era. 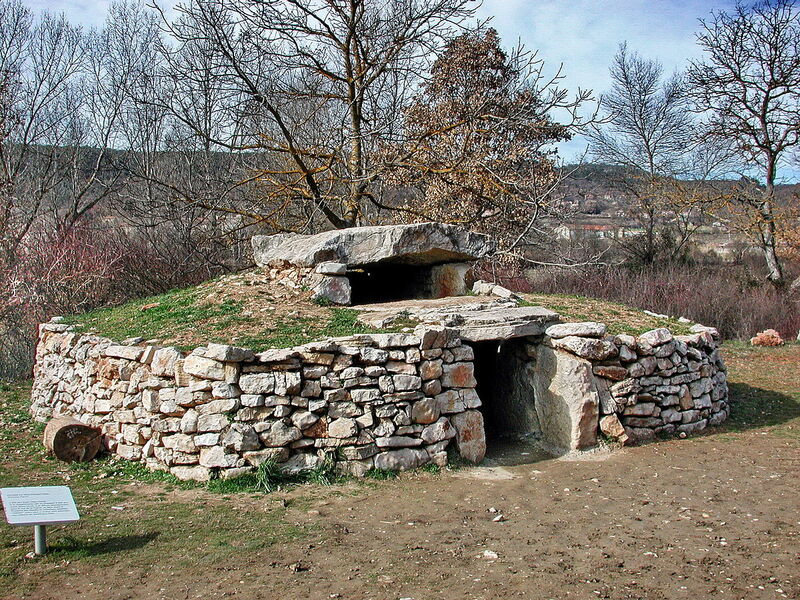 Always on the banks of the Verdon and ten minutes from the museum, do not miss the visit of the prehistoric village, faithful reconstruction of ancient prehistoric habitats, recomposed according to the studies and observations made by archaeologists around the world. Our imagination leaves us to think that the prehistoric men lived exclusively in the caves … Well no! The museum allows you to understand the different types of habitat, through the ages. le cercle de pierre d’Olduvai en Tanzanie. It is the oldest structure built by Man. It is 1.8 million years old. la cabane de Terra Amata à Nice. la cabane en torchis de Charavines. la cabane en pierres sèches de Cambous. The village demonstrates how much the habitats built by our ancestors were diversified and how relevant they were to adapt to the climate and their environment. Moustiers Sainte Marie is famous for its earthenware so do not miss to visit its museum. he traces the different styles according to the different periods. Its founder, Marcel Provence inaugurated it in 1929 and during all the century, it accumulates prestigious pieces. You will be able to admire first of all the famous “blue and white” dating from the XVIIth century then will follow the sumptuous decorations with the Bérain, the various pieces referring to the coat of arms, to the mythological scenes, supported by motifs of flowers, of animals and flags. Finally the nineteenth century is honored with porcelain decorated with garlands and blueberries. At the end of your visit, you are free to buy the precious faiences in the shop. Workshops are also organized.